You’re about to improve your English family vocabulary. While you’re here, check out 27 Different Ways to Say Thank You (And How to Reply). But what do you call your father’s sister’s daughter? And what about your husband’s or wife’s brother? 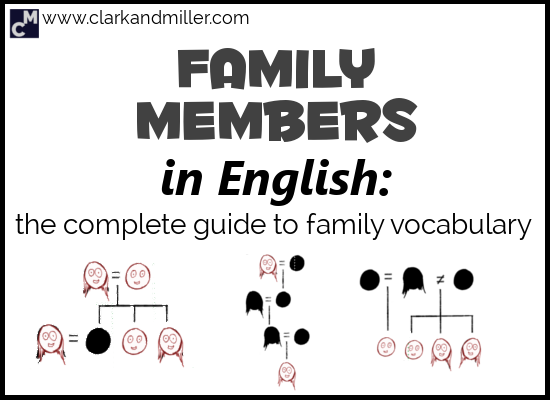 Read on to learn the answers to these questions plus many more family words in English. Your nuclear family is your immediate family. Usually, it’s the family who lives together in one house and typically consists of a mother, father and their children. But as you’ll see, it can get a little more complicated. Kids — This is a more informal and more common word. Offspring — This one is very technical. It’s the sort of word biologists use when they’re talking about cows or rabbits. Feel free to use this one ironically, if you like. If you’re that sort of person. You can also talk about “my girls” if you have more than one daughter. Wait! What does it mean? A sibling is either a brother or sister. So perhaps you have three brothers and eight sisters. This means that you have eleven siblings. Which means you spend a lot of money on birthday presents. It’s a nice, friendly word, and it shows that you’re close to your brother. You can also use it with very close male friends to express closeness to them. It’s pretty informal and might make you sound a bit like a Californian surfer, but it’s friendly and fairly common. If your brother was born on the same day as you (to the same mother), he’s your twin brother. If your sister was born on the same day as you (to the same mother), she’s your twin sister. Some of our brothers and sisters are younger than us, and some of them are older. There are different ways we can express this. Let’s imagine you’re like me, and you have an older sister and a younger brother. Well, he’s your younger brother or your little brother. You can also call him your “baby brother.” This is, of course, a fun way of talking about your younger brother. Don’t use it when you’re filling in a visa form or explaining who he is to the police when you pick him up from the police station. You can, of course, do this the other way around: older brother, a big brother, a younger sister, a little sister and a baby sister. Mum — This is quite informal and quite common. It’s the word I use when I talk about my mum, even if I’m talking to people I don’t know that well. Mummy — This one is kind of childish and probably best used between a child and her mother. If you’re still using this at the age of 29, some people might consider it a little unusual. Mom — This is very common in the US but not in the UK or Ireland or Australia … or anywhere else really. But there are a lot of Americans out there, so you might hear this from time to time. Pop — This is only really used in the US. It’s got a nice sound to it, though, hasn’t it? Pa / papa — A little old fashioned these days, but you still might hear this from time to time. Hubby — A nice, informal way of talking about your husband. I couldn’t think of any other words for “wife.” Certainly not “wifey.” Eugh! Wait — what exactly does it mean? When people talk about their partner, it could be a husband or a wife. But often it signals that these people aren’t married (or sometimes that they don’t feel the gender of their partner is important for the conversation). You might even share a toothbrush. My other half — Nice, isn’t it? My better half — Even better! I like using this one. My significant other — See! Still romantic! Even a little poetic! Girlfriend / boyfriend — A few generations ago, if you said you had a girlfriend or a boyfriend, people wouldn’t think your relationship was that serious. These days, that’s not the case as much. If you’re in a serious relationship, and you’re not married, then you can use these words. Fiancée / fiancé — The person you’ve promised to marry. There’s probably a ring involved. Notice that this is one of the very unusual situations in English where we have a different spelling for females (fiancée) and males (fiancé). Let’s think about the nice family in the picture above. Zerin is divorced and has a child, Filiz, from her first marriage. She’s now married to Alexey, who also has a child from a previous marriage — Val. So we have a household with four people living in it: Zerin and her daughter, Filiz; and Alexey and his son, Val. How do we describe their relationships? Zerin is Val’s stepmother, and Val is Zerin’s stepson. Meanwhile, Alexey is Filiz’s stepfather, and Filiz is Alexey’s stepdaughter. This family keeps on growing! Alexey and Zerin have decided to have a kid together. They called her Simone. OK. So of course Simone is Alexey and Zerin’s daughter. But how is she related to Filiz and Val? They share one parent but not both parents. Easy — Simone is their half-sister. But this family keeps on growing! Zerin and Alexey have plenty of time and energy, and they really enjoy looking after people. They’re happy with their three kids, but they want to help out other kids — kids who don’t have any parents or whose parents can’t look after them. So they decide to take on a foster son, Desmond. Having a foster son is usually a temporary situation. They’re not responsible for him for life, but they’ve agreed to look after him until his situation improves or until he can become independent. You can have a foster son, a foster daughter, a foster mother or a foster father. A lot of languages have different words for each of these people. But not English — one word for all of these people! Can you remember when you were a kid, and there was this one guy who was always at your house? And when you went out as a family, he sometimes came with you? A close friend of your parents who spent a lot of time with you? When there’s a close family friend like this, it’s common for the kids to call him “uncle Timmy” or “uncle Bernard” or uncle plus whatever his name is. One word for all of them! Efficient, right? We can also say “auntie.” It’s closer and less formal. So, we can say “uncle Sammy,” even if Sammy isn’t your real uncle and just a good family friend. You can also say “auntie Olga,” even if Olga is just your parents’ friend. She’s someone you trust like family and enjoy spending time with. Your cousin is your uncle and aunt’s child. In some languages, there are different words depending on which side of the family your cousin is, or whether your cousin is male or female. Again, this is where English is pretty efficient. We use one word for all of them! Have you got a brother or sister with kids? It’s a great feeling, isn’t it? There’s this little person who’s very closely related to you, but who you’re not totally responsible for when he or she starts crying or vomiting everywhere. The best of both worlds! If your brother or sister has a boy, then that’s your nephew. Your mother’s father or your father’s father. Grandpa — Similar to granddad. The choice is yours! Your mother’s mother or your father’s mother. Granny — So cosy, friendly and loving! Nanna — This is only common in some parts of the English-speaking world. You’ll hear it in northern England and Northeast US. But be careful! In some countries, “nanna” can mean “godmother” (more about that later) and even “nanny,” which actually makes more sense, but is less common. In a lot of languages, people use family words like “aunt,” “uncle,” “grandfather” and “grandmother” to address old people in general — even people you don’t know. But we don’t usually do this in English. If you help an old lady get onto the bus in England and call her “auntie,” she’d be pretty surprised and might want someone else to help her. OK. What about your grandmother’s mother? Or your grandfather’s mother? You do, of course, also get great-grandfathers, great-great-grandfathers, and so on. You can also talk about your grandparents and great-grandparents. OK. Let’s go in the other direction. Your children’s children are your grandchildren — “granddaughters” for the girls and “grandsons” for the boys. They’re your great-grandchildren — a collection of great-grandsons and great-granddaughters. This also probably makes you our oldest reader — so congratulations! Keep up the good work! OK. What about your grandfather’s sister? That’s right, it’s your dogfather. No — just joking. It’s your great-uncle. These are the words most people use, however, they’re not technically correct. The “correct” terms are grand-aunt / grandaunt and grand-uncle / granduncle. Click here for more about this. This originally started as a religious thing but is much more general now. Traditionally, when a child was born, the parents chose a godfather and a godmother for the child. They would be responsible for the child’s religious education. But these days, godfathers and godmothers are just symbolic. However, many kids don’t have godfathers or godmothers at all anymore. Unless they’re in the mafia, of course. So your wife’s sister? She’s your sister-in-law. Your husband’s mum? She’s your mother-in-law. You can take this to any extreme. So your wife’s cousin is your cousin-in-law. We also have a phrase, “the in-laws,” to describe any or all of your husband’s or wife’s family as a group. One of our readers, Emma, actually asked us about this in the comments section of an older post, which led me to write this one. Your cousin (as described earlier in the post) is technically your first cousin. As you can see, your first cousin is your aunt’s or uncle’s child — you both have the same grandparents. But what about your second cousin? Your second cousin is your mother’s cousin’s child or your father’s cousin’s child — you both share the same great-grandparents. This can continue forever — so your third cousin shares your great-great-grandparents. By the time we get to fifth or sixth cousins, I’d imagine we’re starting to describe almost everyone in the world. … once removed / … twice removed, etc. This is all about generations — if the person is one generation away from you, she’s once removed; if she’s two generations away from you, she’s twice removed. It can work going down the family tree or going up it. Do any of your first cousins have kids? OK — those kids are your first cousins once removed. “First cousin” because they’re the children of your first cousin. “Once removed” because they’re one generation below you. This can work upwards as well. But not with first cousins. We already have a word for these people: aunt or uncle. But think about your mother’s cousin (or your father’s cousin) again. This person is in your parents’ generation, right? So that’s your second cousin once removed — your second cousin’s parents. By this logic, you can’t have a second cousin three times removed a generation up, because that’s just your great-grandfather or great-grandmother. I mean, how many people know their fourth cousin three times removed? That would be one tight family. Finally, let’s look at some words that describe family generally. Of course we have the word “family.” But how can we use it? This is actually quite a general term. It can refer to someone in your nuclear family / immediate family (like your sister or your dad) or your more distant family (like your fourth cousin twice removed — whoever that is). Personally, I find this awful — it’s like they’re suggesting that the company you work for is just as important as your actual family. Which they’re not. The fam — It’s a shorter, more informal way of talking about your family. “Relatives” is also a general term (like “family”). There are close relatives — like sisters, aunts or cousins — and distant relatives — your great-great-uncle or your third cousin once removed, for example. When we talk about our ancestors, we’re usually talking about our family in a more historical way. Imagine the people living 100 or 200 (or 1,000 or 10,000) years ago. People who you’re related to but you just don’t really know about. The word “family” has a lot of emotional meaning behind it. The word “ancestor” is more objective. It’s used in a more historical, objective way. What’s the difference between a descendant and an ancestor? Well, an ancestor is someone who lived before, but a descendant is someone who lived after. Great! You got to the end! Describe more people in your family — even distant relatives. Describe the people in your family in new and interesting ways. Who’s the most distant relative that you know? Which one of your family members do you not see as often as you’d like? Leave the answers in the comments! First – thank you! All the material was very well presented and explained. New for me was the expression “removed”, I have never come accross with it before. So thanks once again. Looking forward to smth new! Thanks a lot. It’s great when I hear about the new stuff in the posts. Excellent learning material.But one doubt: is it correct to say ,’older brother’. I think,in British English,it is ‘elder brother’.Kindly enlighten me. I would normally avoid using “elder” brother. But that’s largely because I’m British! It’s actually quite acceptable in many forms of American English. Thank you! It’s useful and interesting. 1. Should I say My older brother or my elder brother ? 2.Is there some word for grandmother on my mother’s side and grandmother on my father’s side ? 1. I always go for “older brother,” but that’s because I’m British. “Elder brother” is actually acceptable in the US.